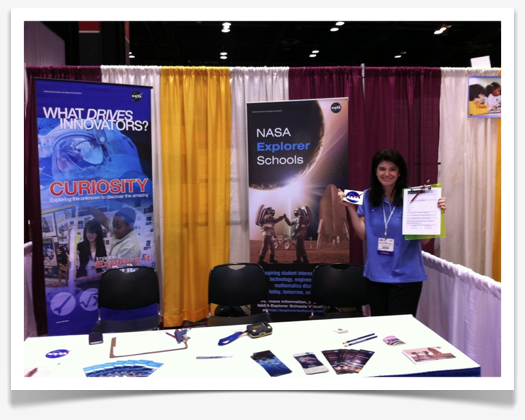 Visit NES in the 900 aisle in the exhibit hall at the National Education Association Conference. The exhibit hall at the conference runs from June 30 – July 2. In this final NASA Now program of the 2011-2012 school year, Katie Presson of the Payload Operations Integration team at NASA’s Marshall Space Flight Center, discusses investigations being conducted on the ISS. She describes the detailed process of getting science investigations, or payloads, approved and ready for their journey to the ISS. Presson also discusses safety requirements and describes some unique experiments for education and how teachers and students can be involved. Click on the video link below to watch a preview of this program. NASA’s educator guide How High Is It? includes mathematics activities to explain scale size and scale distance. The guide helps put aside misconceptions about how far away spacecraft and satellites are. At 22,240 miles above Earth, spacecraft put into orbit over the equator travel at 7,000 miles per hour around the equator and follow Earth’s rotation. To find out more about the activities in the educator guide How High Is It?, read the article in the Satellite Meteorology forum in NEON. Dawn, a mission belonging to NASA’s Discovery Program, delves into the unknown, drives new technology innovations and achieves what has never been attempted before. Dawn is orbiting asteroid Vesta, then heading to asteroid Ceres to gather more data. Dawn’s goal is to characterize the conditions and processes of the solar system’s earliest epoch by investigating in detail two of the largest protoplanets remaining intact since their formations. Ceres and Vesta reside in the extensive zone between Mars and Jupiter together with many other smaller bodies, called the asteroid belt. Ceres and Vesta are two of the biggest asteroids in the solar system. Ceres is so big that it is classified as a dwarf planet, and Vesta is not far behind. This mission will help NASA understand what the conditions were when Vesta and Ceres formed at the dawn of the solar system. Dawn will fit more pieces into the grand puzzle of how our solar system formed and evolved — and perhaps how others do as well. The 50th anniversary of America’s first manned spaceflight is being commemorated with the issuance of two stamps. The stamps went on sale May 4, 2011. One stamp salutes NASA’s Project Mercury, America’s first manned spaceflight program, and NASA astronaut Alan Shepard’s historic flight on May 5, 1961, aboard the spacecraft Freedom 7. The other stamp draws attention to NASA’s unmanned MESSENGER mission, a scientific investigation of the planet Mercury. On March 18, 2011, MESSENGER became the first spacecraft to enter into orbit around Mercury. These two historic missions frame a remarkable fifty-year period in which America has advanced space exploration through more than 1,500 manned and unmanned flights. Donato Giancola of Brooklyn, N.Y., who based the stamps on NASA photos and images, designed both stamps. The release of the MESSENGER stamp is related to the NASA Explorer Schools content module, MESSENGER: Cooling with Sunshades. To learn more about the MESSENGER stamp, go to the article in NEON. To use the MESSENGER: Cooling With Sunshades lesson and activity in your classroom, log into the NES Virtual Campus and click on the Teaching Materials button in the left column. The activity is an engaging, hands-on lesson covering physics concepts including temperature, latent heat, state of matter and transfer of energy. To find out more about the activities in the How High Is It? educator guide, read the article in the Satellite Meteorology forum in NEON. People in many countries throughout the world use satellite images and data. It’s important to be able to determine the exact time a picture was taken or data collected. To meet this need, satellites use a time stamp standard for tagging images and data — Universal Time, referred to as UT; or Zulu Time, designated by the letter Z; or Greenwich Mean Time, abbreviated as GMT. All three designations refer to the same time. The recorded time is the time at the 0º line of longitude, which runs through Greenwich, England. 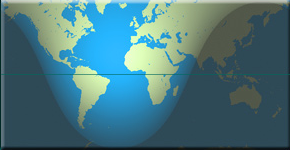 When a satellite picture is taken or data set collected, it is logged according to traditional military notation for time in the 24-hundred hour notation, based on the time at 0º longitude. This subject offers the potential for student investigations, mathematics activities and history lessons. Share with other educators any time-related lesson plans you have used with your students by replying to the UNIVERSAL TIME posting in the Satellite Meteorology forum in NEON. NASA will host a news conference at 1 p.m. EDT on Thursday, June 16, to reveal new images and science findings from the first spacecraft to orbit Mercury. The event will be held in the NASA Headquarters. NASA Television and the agency’s website will broadcast the event. NASA’s MErcury Surface, Space ENvironment, GEochemistry, and Ranging, or MESSENGER spacecraft conducted more than a dozen laps through the inner solar system for six years prior to achieving the historic orbit insertion on March 17. This news conference connects the NASA MESSENGER mission to the MESSENGER content modules on the NASA Explorer Schools Virtual Campus. Be sure to watch this exciting news conference and see the new information the MESSENGER satellite is bringing us.